i was walking along. 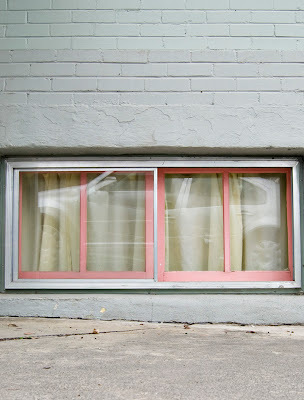 trying to find something with some unexpected color (for my color photo class) and happened upon this cute, blue brick shop with pink trim around the windows. i ran around to the side and snapped a pic. when i printed it and took it to class a girl (who i don't know. at all.) said "hey! who took a picture of our bedroom window?" i fessed up. (it was pretty embarrassing actually.) and she said she hoped she wasn't in there. p.s. i joined up. summer photo project. That is HILARIOUS!! What are the odds?!?! Is she the one that painted it so cute? That is funny! Did you notice the car reflection in the window? Is it yours? If you like color you ought to go to that purple house on East River Rd. It's got color, yes it does! Geri! Hey this is Catherine from WINGS (you know...the feather girl who wants to adopt your family :) ). Anyway, I'm reorganizing my business and wanted to make you and your lovely family aware of the changes! They are: No more WINGS. WINGS is now Skidamarink and the new website to order from is www.Skidamarink.etsy.com. Also, to get to my blog (which was once WINGS but now Skidamarink) it is www.skidamarinkado.blogspot.com. There you go! I'm in Houston now and have access to all kinds of ridiculously cute materials so let me know if you want anything! And check out my new site! New cute stuff coming soon! Thanks for the support from you and your family! And, by the way...AMAZING photography!! LOVE IT! !